Hong Kong Bird Watching Society (HKBWS), which is the only local civil society aiming at appreciating and conserving Hong Kong birds and natural environment, was established in 1957. In addition, HKBWS was recognized as an approved charitable institution of a public character in 2002. At the moment, HKBWS has nineteen full-time staffs and our volunteers also help a lot in various aspects such as leading birdwatching activities. There are more than 1,700 local and overseas members and the membership number is increasing. Besides publishing bulletins and Hong Kong Bird Report regularly, HKBWS also organized birdwatching tours and indoor meetings. In the past, HKBWS helped to build the new bird hide in Mai Po, update the Hong Kong Bird List and set up the HKBWS China Conservation Fund in 1999 so as to support the birdwatching promotion and research works of birdwatchers and ornithologists in China mainland. HKBWS has been cooperating with more than 20 institutions and organizing birdwatching courses at different levels to promote birdwatching in Hong Kong. Besides, conducting bird surveys and researches, managing important bird habitats and helping the establishment and development of birdwatching societies in China mainland are also our main duties. 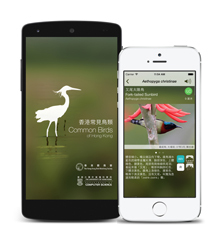 Since the establishment of BirdLife International in 1994, we have been their Hong Kong Affiliate and they gave us great support in the conservation of Long Valley. In 2005, HKBWS cooperated with BirdLife to launch the China Programme to encourage birdwatching activities in China mainland. The logo of HKBWS is Chinese Egret - a species which visits Hong Kong during the migration period but bred here previously (the last breeding record was at A Chau in 1982). 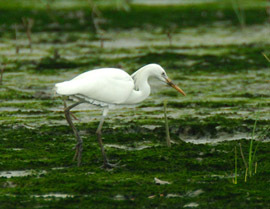 Chinese Egret is now categorized as Vulnerable (VU) by the IUCN with a world population of less than 3,400.